The Apple Watch isn’t trying to be ostentatious and is far from being characterized as pretentious. It wasn’t built nor designed to impress or attract notice. Health information, integration in our day to day in the Apple ecosystem and the screen are just superb. I’ve usually been early to Apple device parties, but for the Apple Watch, I’m late, as in 4 years late. The reason? I just didn’t see anything compelling enough for me to jump in… but that changed in the past few weeks. Without going into too much detail, let’s just say that my health has become more important to me, and some details and insights provided by this watch could make a difference in my day to day. 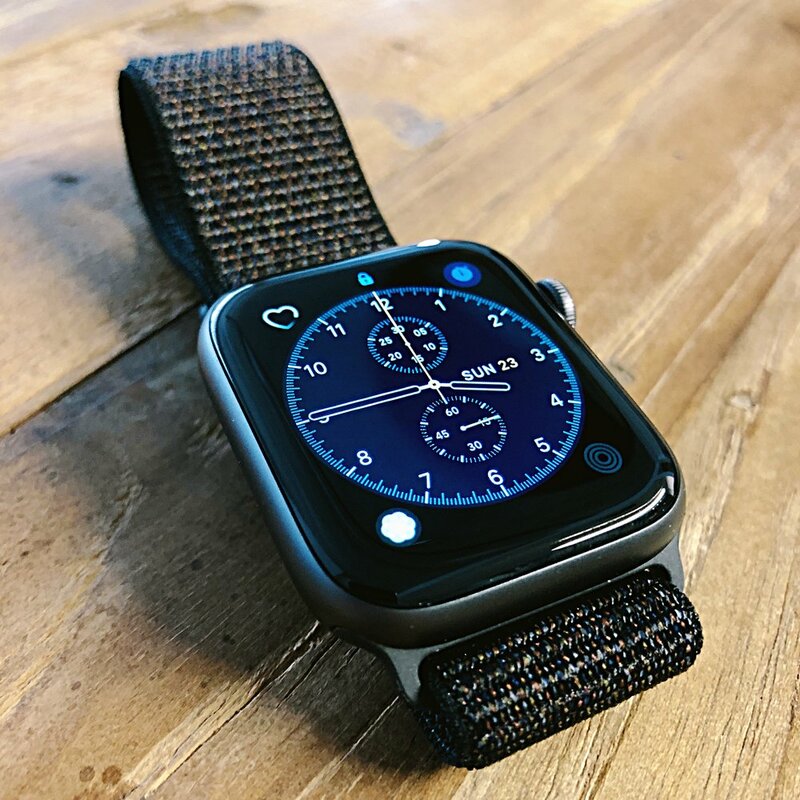 The watch feels good, but it isn’t a religious experience… I honestly can’t say "I can definitely feel the quality" as mentioned by so many bloggers in the past years. It isn’t bad or anything. I think the best way to put it is - it’s a nice device and is clearly well built. Maybe I’ll be able to appreciate more as time passes, but that’s for an update on my thoughts coming in a few weeks. I can’t say anything about the last models of the Apple Watch, as I only played a few minutes with each of them. But the Series 4 is very comfortable and light enough not to be annoying, but heavy enough for it to feel good. But nothing of the Apple Watch reminds me of my U-BOAT Italo Fontana. After a few days with the watch, it most usually feels great, wearing a shirt or a blazer. Going to the gym with the watch also feels great and never really feels in my way. Though I wear it just a bit higher on my arm as I weight train. I consider my wrists to be of normal size, so the black sport loop is just perfect and should fit anyone easily. Simple, elegant and to the point. The Apple Watch isn’t trying to be ostentatious and is far from being characterized as pretentious. It wasn’t built nor designed to impress or attract notice. It’s lowkey and I find that really great. It brings back memories of the classic analog alarm clocks made by Braun. The watch automatically unlocks my MacBook Pro when I open the lid. It transparently adds the activities I’ve done and the calories burned in my health app (currently using MyPlate on iOS). I can easily follow my health, heart rate and its regularity. This is a big plus for me. Breathing exercises are built in and work very well, I’ve now started to expect them and appreciate the minute of relaxation. The screen is amazingly clear, even outside. This really makes using the device a real joy. I can easily control my music without having to take out my iPhone. I’ll have more, but for now I just wanted to share a few bits right from the start. Here is a great review of the new features found in the Series 4 found on Apple Insider.